About a year ago I went to Serbia to visit my relatives. Every visit is a crash-course in Serbo-Croatian, whether it's learning to pronounce the sounds that don't quite exist in English, phonetically sounding-out the Cyrillic or learning new, creative ways to swear. There are not very many opportunities to practice Serbo-Croatian in Portland, Oregon, so I relied a lot on watching YouTube videos and, frankly, guessing. It's a surprisingly tricky language to learn and even seemingly simple idioms in English have a tendency to translate strangely — like asking for a "glass of water" can sound like you're asking for a glass made out of water if you use the wrong article. I discovered a simple practice trick though with Google Translate that helped quite a bit. One of the coolest features is the ability to speak into your microphone instead of type. You can access this on the website by clicking on the microphone icon in the bottom-left-hand corner. Although speech-to-text services are getting better all the time, they're still prone to misunderstanding. I find I have to make a conscious effort to enunciate and speak a little slower than I normally might. In this case however, that's actually a good thing! 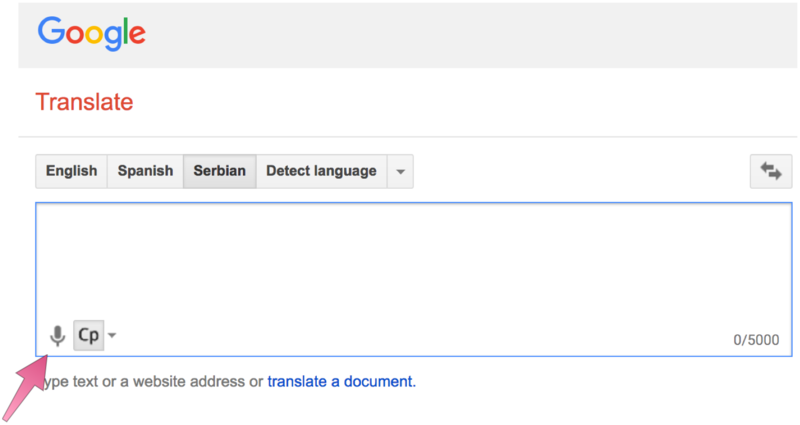 I reasoned that, if Google could understand me as I tried to wrap my mouth around some of the trickier sounds in Serbo-Croatian, my relative and other people might be able to understand me as well.